Heard of a Hindu temple where people of all castes are invited? 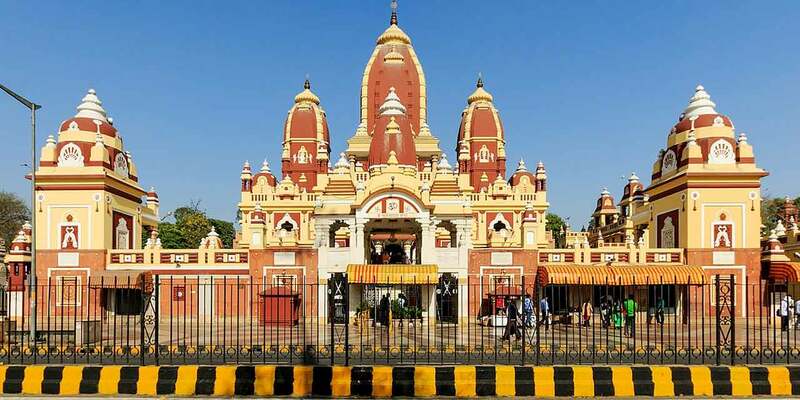 Well, if you haven’t then you must visit Laxminarayan temple in Delhi. Also known as the Birla temple, it is one of the biggest Hindu temples of the city. As the name suggests, the temple is dedicated to Lord Laxminarayan, better known as Lord Vishnu, or the preserver in the Trimurti, comprising of Brahma, Vishnu and Mahesh. Lord Narayan is with his consort Goddess Laxmi (the goddess of prosperity), hence the temple is called Laxminarayan Temple. Built by the industrialist Baldeo Das Birla, along with his sons, from 1933 to 1939, this temple is more than a religious destination. The temple was inaugurated by Father of the Nation Mahatma Gandhi, on the condition that it will be open for people of all castes. The Laxminarayan Temple in Delhi is located towards the west of Connaught Place area and is a major tourist attraction. It is spread over an area of 7.5 acres and comprises of many fountains, shrines and sculptures of religious and national importance. The temple also has a Geeta Bhavan which is used for discourses. The Laxminarayan Temple is a major attraction amongst the localites and the tourists during Janmashtami and Diwali festivals. Also known as the Birla Temple, this majestic monument was built by the very popular industrialist Birla family. BD Birla, along with his son Jugal Kishore Birla started the construction of the temple in the year 1933. The foundation stone of this popular temple was laid by Maharaj Udaybhanu Singh. Pandit Vishwanath Shastri was the guide throughout the making of the temple. Once the construction was completed, the concluding ceremony and Yagna was performed by Swami Keshav Nandji. Mahatma Gandhi is accredited to have inaugurated the temple with a unique condition that entry in the temple will not be defined by the caste of the devotees. He emphasised that devotees of all castes should be allowed to pray in the temple, whether he is a brahmin or a shudra. The Laxminarayan Temple is not just a place of religious importance but also an exquisite piece of architecture. The designer of the temple, Sris Chandra Chaterjee, was one of the prominent leaders of the Modern Indian Architecture Movement. It was a very interesting time in the country. The country was witnessing the Swadeshi movement at large. The architecture of Birla Temple speaks volumes of the times it was constructed in. The Swadeshi movement of early twentieth century is quite visible in the architecture of the temple. A whole lot of canonical texts have been used in the monument throughout. Chaterjee was a man known for his modern mindset. While keeping the religious and national importance of the place intact, Chaterjee extensively used the modern technologies and materials to create the monument. The Birla temple is a three-storeyed building and is built in the Nagara style of temple architecture. Scenes from the golden yuga of the present universal cycle can be seen carved around the temple walls. Hundreds of artisans from Benaras had put together their craft to carve the icons around the temple, under the able leadership of Acharya Vishwanath Shastri. The icons are made up of marbel stone, sourced from Jaipur. The temple also has work of Kota stone that was brought from various places like Makarana, Agra, Jaisalmer, and Kota. One of the biggest highlights of the temple is its Shikara, that is above the sanctum sanctorum. It is about 160 feet high. The temple is east facing and looks amazingly beautiful during the sunrise. It is situated on a high plinth and is adorned by some fresco paintings as well. The Geeta Bhavan situated towards the north of the temple is dedicated to Lord Krishna. There are also side temples with the main temple, dedicated to Lord Shiva, Buddha and Krishna. If you are a fan of architectural beauty, this place is a must-visit. Its artificial landscape and cascading waterfalls add to the scenic charm of the place. The main temple houses Lord Vishnu and Goddess Laxmi. It is a huge hall and accommodates a lot of people during the Aarti times in the morning and evening. The side temples of Lord Shiva and Lord Krishna also attract a lot of devotees throughout the year. There is also a temple of Goddess Durga, the epitome of power, in the left side temple shikhar. This temple is a special attraction during Navratri and attracts people from across the city. Birla Mandir opening time is 4:30 AM. It is open till 1:30 PM in the afternoon. The temple is again open for visitors from 2:30 PM onwards. Birla temple closing time is 9:00 PM. There is no entry fee to visit the temple. Cameras are not allowed inside the temple. Buses: DTC buses number 216, 610, 310, 729, 966, 990A1, 871 and RL77 pass through the Laxminarayan temple from 6AM to 10 PM. Metro: RK Ashram Marg Metro Station on Blue Line. Autorickshaw and Taxi: Delhi has a well connected auto-rickshaw and taxi network. There are Ola and Uber cabs that can be booked from any part of the country. There are a host of apps for booking auto rickshaws as well, like Jugnoo and Ola, which are frequently used in Delhi. Mobile phones, cameras and other electronic items are submitted at the entrance of the temple complex. Lockers are available for keeping the goods safely. These lockers are free of cost. There is no entry fees to enter the temple. One visit to the temple takes 30-45 minutes and it is good to go around the Arti time in the evening. Best time to visit the Birla temple is during Janmashtami, Diwali and Ram Navmi. One can see elaborate decorations in the temple during the festive times. Nearby attractions of the temple include places like, India Gate, Jantar Mantar, Rashtrapati Bhavan, Gurudwara Bangla Sahib, Hanuman Mandir, and some popular hotels and restaurants like Hotel Imperial, Hotel Le Merdian, the revolving restaurant Parikrama, et al.